The last weeks have been incredibly hot and generally I am sensing a lack of motivation in general. I feel like I could use the time to be more productive and get more projects moving but I end up just putting my feet up in the air and drinking cool drinks all day long. To be honest summer is a time of greater stress for me because as a free-lancer it can be challenging to keep making money consistently. The lack of work in combination with having a house filled with children means more need for personal space and also a need for more structure to achieve a balance that is suitable for everyone. I do see an advantage in letting go of preset ideas about how things should be and it pushes me into becoming the person that I am. It helps me to surrender to what is and navigate a space to use my creativity and get really clear about what I really want. This changes daily with me but at the moment it is clear as crystal. I want to be of service to others creating delicious plant-based food. I try not to get discouraged and explore the possibilities and options the summer offers to develop new skills and focus more on my self-care routine. Plenty of time to meditate or do yoga, go for long nature walks, go swimming and of course develop recipes. Recently I was introduced to a dish called Eton Mess and I was intrigued and wanted to explore it in a vegan form so I got to it. Since this time of the year is a great time to forage wild berries I noticed wild blackberries on a few walks I took and I decided I wanted to create a version with wild blackberries. It was actually very easy and I was very happy with the results. 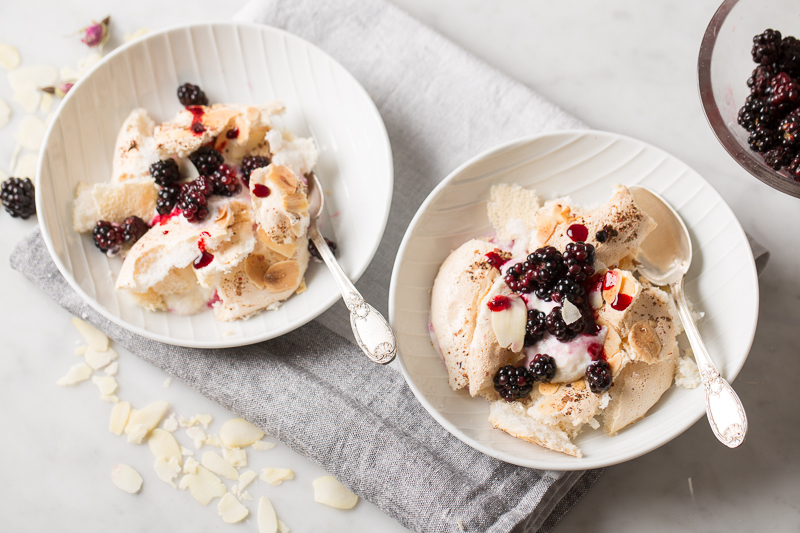 Eton Mess is a naturally gluten-free dessert made with broken up meringues, whipped cream and some kind of berry. It is commonly believed to originate from Eton College and is served at the annual cricket match. An Eton mess can be made with any types of summer fruit, but strawberries are regarded as more traditional. The word mess refers to the mess appearance of the dish. I quite like its appearance and that it is relaxed and if served in tall champagne glasses I think they would be worthy of an elegant dinner party. 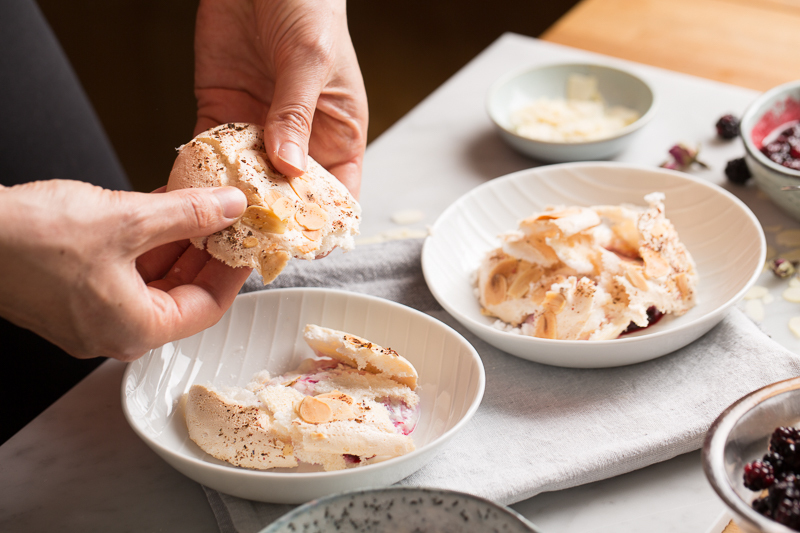 Another bonus of this recipe is if you have pre-made meringues you can put this dish together in minutes. I decided on using coconut yogurt as a creamy alternative to the whipped cream and I cooked some of the blackberries into a compote. 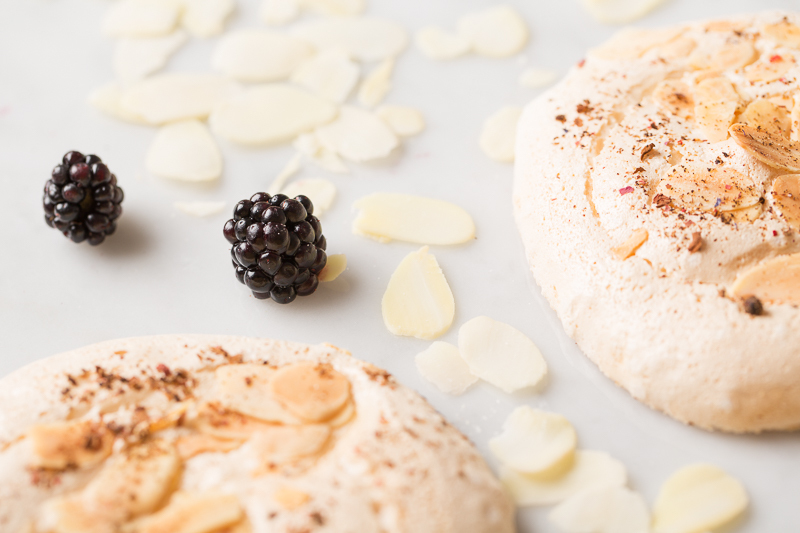 The combination of jammy, inky black compote and fresh, tart blackberries was a nice contrast to the sweet and crispy meringue. 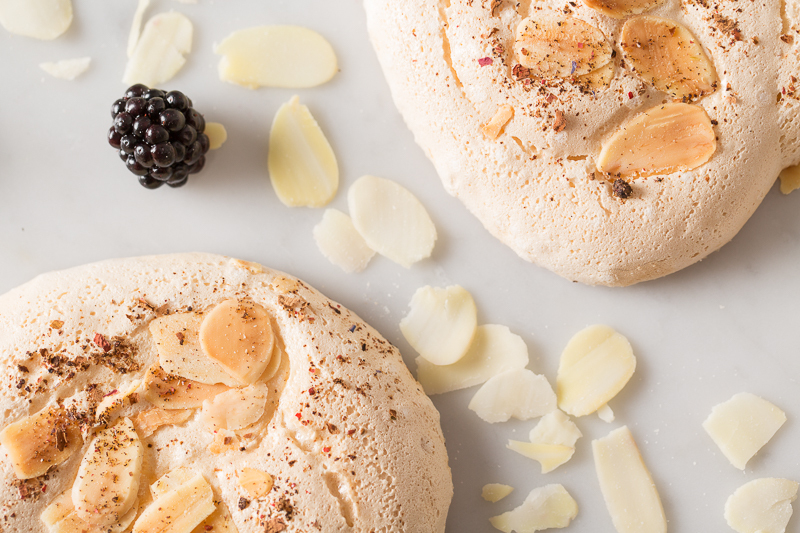 The most important component is of course meringue and here I turn to to Aquafaba to recreate astonishingly authentic but egg-free meringues. I’ve gone into detail about Aquafaba in this post and also in this one. Its great for making meringues, vegan chocolate mousse, macarons, pavlovas and much more. 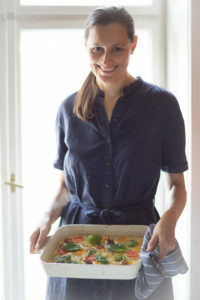 I’ve also used it in vegan omelettes with a chickpea flour base. It is really very versatile and makes so many dishes accessible to people who would normally not be able to eat them. I haven’t got into all the applications but I have made meringues before and have used it in cake bases. It is amazing how it magically foams up into a white cloud and with a touch of vinegar even stays quite firm. In many recipes cream of tartar is recommended to stabilize it but since that is not available in Austrian supermarkets I use vinegar or lemon juice instead. Since there is so much information out there on the internet you have a wide array of recipes using Aquafaba to experiment with and also a cookbook. 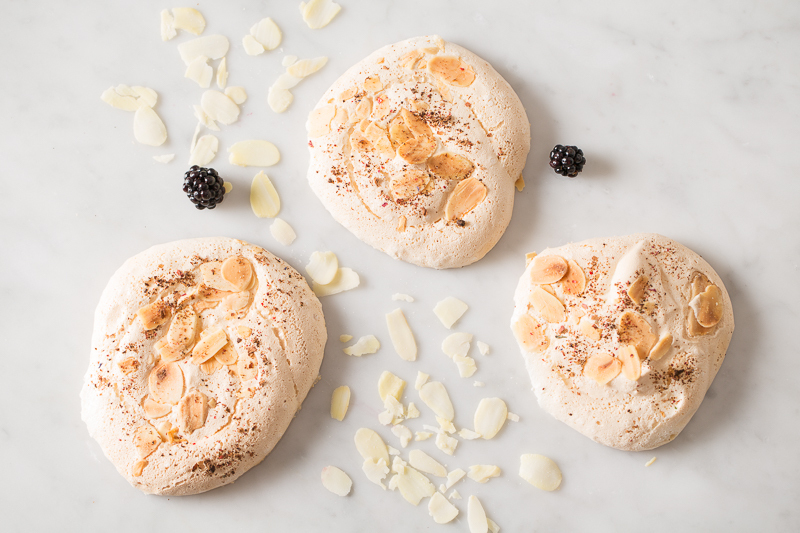 Finally, the other bonus about this recipe is that it covers almost all allergies, besides sugar although you could try making the meringues with an alternative sweetener. I found that they need sugar to help the structure. Its naturally gluten-free, dairy-free, nut-free if you leave the almonds out and grain-free. I played around with the flavours as well. You can keep your meringues simple and flavour them just with vanilla but I decided to amp up the flavour by adding a spice blend with dried strawberries, pink peppercorns and rose petals. Next time I’ll leave it for a sprinkle at the end because during baking it turned brown and didn’t have the effect I was going for. Keep in mind that making meringues takes a few hours but once they are done it is a short affair. You know I am all about slow living so time is of no importance to me but for those of you who are pressed for time, I truly understand. Just plan a little in advance and you’ll have a killer dessert in minutes. If you make this I would love to hear some feedback to hear how it went and if you share it on Instagram don’t forget to tag me #vegan__art. Thanks for stopping by and have a great day! Preheat the oven to 150°C. Line a baking sheet with parchment paper and set aside. Make powdered sugar by putting in a high speed blender and blend it for 10-20 seconds until fine. Put the powdered sugar in a bowl. Using a mixer with a whisk attachment put the liquid from the can of chickpeas and the apple cider vinegar and whip for up to 10 minutes until the Aquafaba forms stiff peaks. Don’t worry! You can’t over whip it. A good test is to turn it upside down. It should stay firm in the bowl. Now slowly add the powdered sugar spoon by spoon until everything is incorporated and in the end add in the spices. Fill the mixture into a piping bag or just place big blobs of meringue onto the parchment paper and smooth it out into a consistent shape. Sprinkle them with almonds and more strawberry powder, pink peppercorns and rose petals. I like them quite big but the appearance is not important here. Be wild! Bake for the first twenty minutes at 150 °C and then reduce the temperature to 100 °C and continue to bake for 50 minutes. Turn the oven off and keep the oven door ajar by putting a wooden spoon in the gap and let them finish baking for another hour. For the compote, place the blackberries into a small pot. Add the lemon juice and maple syrup and gently bring it to a simmer. In a separate bowl mix the arrowroot powder with a tablespoon of water. Add this mixture to the simmering blackberries while continuously stirring. Once the blackberries start releasing more juices and start thickening, remove from the heat. Set aside to cool off. 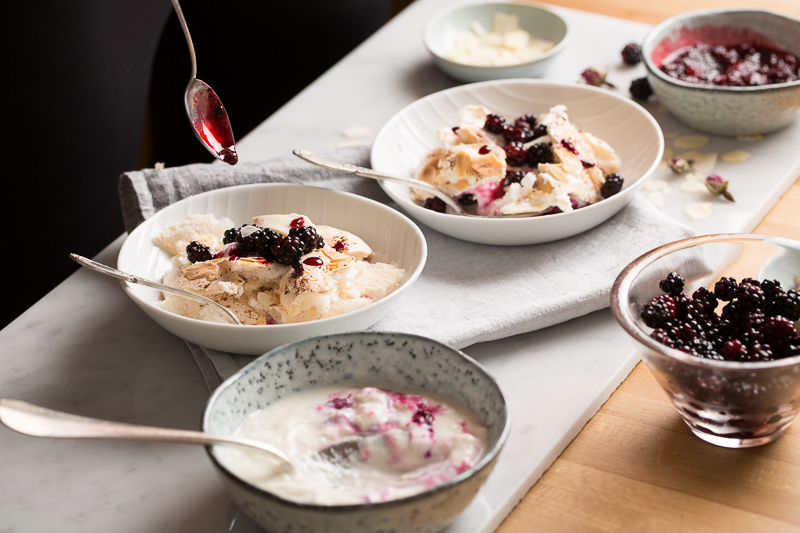 To assemble the Eton mess, start by layering coconut yogurt, broken meringues, blackberry compote, blackberries and a sprinkling of almonds. 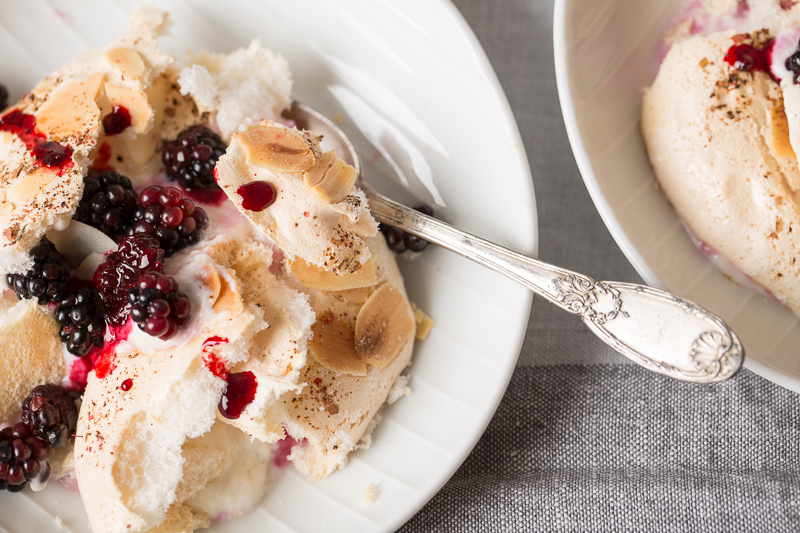 Continue with another layer and finish of with a drizzle of blackberry compote and almonds. Serve immediately. I’ve been away from blogging for awhile and just saw your comment. Thank you for your lovely feedback!